Each summer, forest rangers stand guard atop remote fire towers across Oregon, scanning the horizon for smoke. But when fire danger subsides in the fall, adventurous travelers rent the lookouts and take in awesome views from these sanctuaries in the sky. Green Ridge Lookout is an ideal base camp for exploring Central Oregon. 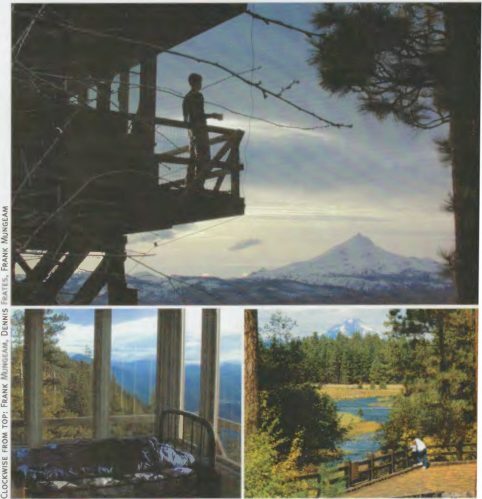 The two-story wooden tower clings to the side of Green Ridge, 500 feet above the verdant Metolius River Valley. Six snow-capped peaks pierce the horizon. Directly facing the lookout, Mt. Jefferson towers tall and majestic. Outside on the narrow catwalk that circles the tower, the air is rich with the scent of pine. Inside, the cabin is spartan but sufficient, stocked with hardy wooden chairs and a rugged dining table and two beds. Propane fuels the cookstove, heating and lighting. Guests supply food, water and bedding. At night, the only sound is the whistling of the wind. Morning sun floods the cabin, commanding visitors to action. Start the day with an invigorating hike up 6,436-foot Black Butte, just south of Green Ridge. From Forest Service Road 11, follow the sign to Black Butte Trail. Don hiking boots or snowshoes, then hike up the two-mile trail to the summit of this perfectly symmetrical lava cone. The narrow sun -sheltered path tilts upward and twists through dense forest. Near the summit, the few surviving trailside trees are contorted by unrelenting winds. Atop Black Butte, several fire lookouts stand watch and Cascade peaks wink back in every direction. The return hike, of course, is all downhill. In the afternoon, revitalize by witnessing the birth of a river. The Head of the Metolius is at the Camp Sherman turnoff, five miles west on Highway 20. From the parking area, a brief walk leads to the spot where the headwaters of this pristine river gush from the ground. Spend the next day exploring the trails at Three Creek Lake, just outside the western town of Sisters. If the trail is snow­ covered, you can rent skis or snowshoes in town, then follow Elm Street, which turns into Forest Service Road 16, to Three Creek Sno-Park. The trail to Three Creek Lake meanders steadily uphill for five miles. Pause to rest halfway at the trailside ski shelter. A mile later in Three Creek Meadow, look up at impressive Tam McArthur Rim, which towers 1,200 feet above the trail. Views of Black Butte and Mt. Jefferson await at Three Creek Lake. The five-mile return trip is mostly downhill. 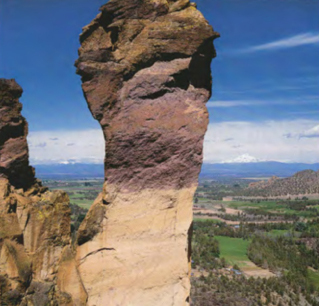 After a night’s rest, head east from Sisters to Redmond and continue north to Terrebonne, where both the violence and the artistry of volcanic forces are on display at Smith Rock State Park. Multicolored cliffs and spires soar 600 feet skyward, thrust from the ground by erup­tions, then shaped by wind and water into remarkable formations. Hike the steep switchback trail to Misery Ridge and watch as acrobatic climbers scale the ape­ shaped monolith Monkey Face. Or stroll along the River Trail, which parallels the aptly named Crooked River. For real adventure, hire a professional guide and experience the exhilarating vertical world of rock climbing at one of the world’s most famous climbing areas. 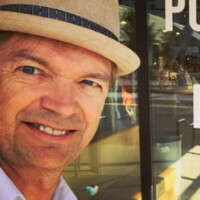 Frank Mungeam is a passionate digital thought leader and teacher adept at creating a culture of collaboration and innovation. He is a Knight Professor of Practice, Newsroom Innovation at Walter Cronkite School of Journalism and Mass Communication. Frank empowers content teams to identify and skillfully apply new digital, social and mobile tools to create unique and compelling content that engages and informs audiences. Connect to Frank via LinkedIn @frankwords or Twitter. You may check out Italy Travel Guide on the Summer in Italy website (images: Pixabay). The Sorrento Peninsula or Sorrentine Peninsula is a peninsula located in southern Italy that separates the Gulf of Naples to the north from the Gulf of Salerno to the south. Known as the land of the sirens, in honour of the mythical maiden-monsters who were said to live on Li Galli (a tiny archipelago off the peninsula’s southern coast), the area to the west of Sorrento is among the least developed and most beautiful in the country. Fantastics walks exploring the Amalfi Coast, Capri, Positano and Sorrento. Incredible views over the turquoise sea, villages, lighthouses and Mt. Vesuvius. Guilt-free indulging in foodie delights, knowing you’ll walk it off tomorrow! Breath-taking coastal views from the world-famous ‘Footpath of the Gods’. The glamour of Positano and Capri, contrasting with authentic Praiano. The Sorrento Coast is a jagged promontory that shores up the southern end of the Bay of Naples. This peninsula of hilly terrain ends abruptly at a cliff that plunges sheerly down to the Mediterranean sea. The entire coastline around Sorrento was a Greek colony during the period of Magna Grecia, the legendary site of Homer’s sirens, before being conquered by the Romans who enjoyed the area as a summer playground. It has maintained a reputation as an exclusive resort destination ever since. It boasts a mild climate, gorgeous panoramas and citrus-scented air. 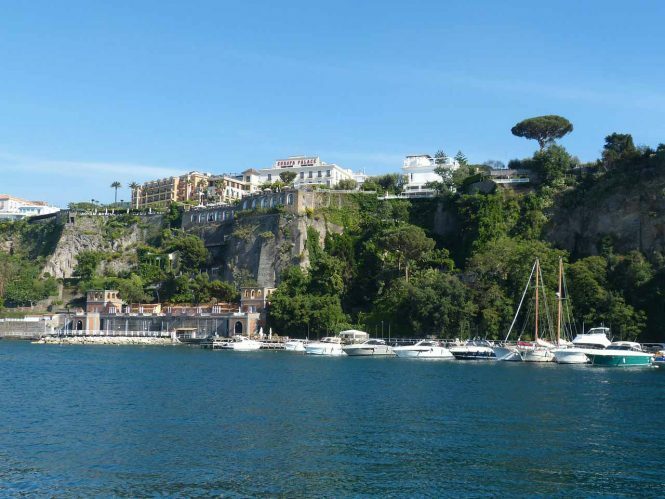 There are magnificent views at every turn as one drive around the harbor, the best from the high points overlooking Punta Campanella, the westernmost point of the Sorrento Peninsula. Offshore, Capri looks tantalisingly close. While the Mediterranean is the big draw that made Sorrento famous, there are hamlets in the hills that should be explored, too. These time-worn villages maintain their traditions and their charm. Visit Vico Equense, which is dwarfed by the Lattari Mountains that rise up behind it, the village of Seiano, the white-washed town of Priora and Sant’Agata sui Due Golfi, high in the hills. Up here you’ll find natural beauty, hiking trails, tranquility and clean, dry air. Arrive in Amalfi and overnight. The Valley of the Ancient Mills Walk, 14 km. Mt Tre Calli & Footpath of the Gods walk, 14 km. Walk the Footpath of the Gods to Positano, 11 km. The Isle of Capri, 8 km. Punta Campanella & Mt San Costanzo, 7 km. by Jimoh Babatunde, Ayodeji Ayodele and Kola Tubosun | A trip to Olumo rock usually commences with a climb up the man-made stairs carved into the rock. The journey continues with climbs on irregularly sized rocks (or ladders which are now provided) through a narrow corridor that leads to the top of the rock. Olumo Rock is a mountain in south-western Nigeria. It is located in the ancient city of Abeokuta in Ogun State, and was historically used as a natural fortress during inter-tribal warfare in the 19th century. Nigeria, an African country on the Gulf of Guinea, has many natural landmarks and wildlife reserves. Protected areas such as Cross River National Park and Yankari National Park have waterfalls, dense rainforest, savanna and rare primate habitats. One of the most recognizable sites is Zuma Rock, a 725m-tall monolith outside the capital of Abuja that’s pictured on the national currency. Olumo is a popular tourist attraction. It provided protection to the Egba people when they needed it, and is now held in high esteem by the members of the clan. The mountain is one of the most popular tourist destinations in the heart of Abeokuta (a name which means “Under the rock” in the Yoruba language) in Nigeria. It’s at an elevation of 137 meters above sea level. 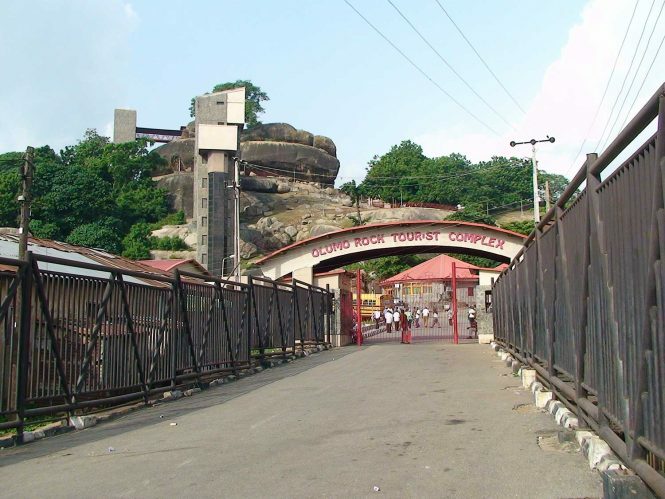 Abeokuta was originally inhabited by the Egbas, who used the rock as a sanctuary at a higher elevation to monitor enemy’s advances, leading to eventual triumph in war. The town of Abeokuta eventually grew as these new settlers spread out from this location. Abeokuta is just about an hour’s drive from the bustling metropolitan city of Lagos, providing convenient access to an array of hotels, restaurants, clubs, casinos and various nightlife activities. Lagos is also home to the closest airport to Abeokuta, the Murtala Muhammed International Airport. Most of the Hotels in Abeokuta are within few minutes’ drive from the rock. New renovations completed in early 2006 upgraded the infrastructure of the site to include a new museum, restaurants, water fountain and the ancient Itoku market, where local artisans and traders enjoy haggling over prices just as much as the customers like to find a bargain. The Complex houses both modern and ancient facilities that have been incorporated into the Rock to make the environment one of a kind home away from home tourist destination. The market lies just outside the Olumo rock premises. It is the center of the indigenous Abeokuta industry of tie-and-dye, locally known as adire. Adire crafters, usually women both old and young, show off their designs in sheds alongside the roads. Behind these sheds are buildings where several generation of these crafters live and work. The locals are very friendly and if asked, will often give tourists and visitors informal tours of the dyeing areas. Other popular items to watch out for include local beads, bracelets, sculptures and musical instruments like the sekere and talking drum. A trip to Olumo rock usually commences with a climb up the man-made stairs carved into the rock. The journey continues with climbs on irregularly sized rocks (or ladders which are now provided) through a narrow corridor that leads to the top of the rock. All along the way, catch sights of carvings in the rock, cowrie-studded statues and the ancient abode of the priestesses of the mountain deity who live in huts on the rock. Climbing the rock could be extremely challenging, most especially for the aged, the installation of this facility has greatly helped to attract more visitors to Olumo Rock, but the fun still lies in using the old stairway. As we make our way to the top of the rock, it leaves many breathless and ready to take a break to rest on the benches under the trees growing from the rock and enjoy some clean breeze. The journey continues with climbs on irregularly sized rocks through a narrow corridor that leads to the top of the rock. At the summit of the rock, tourists have the opportunity of having a panoramic view of the city from atop the rock. 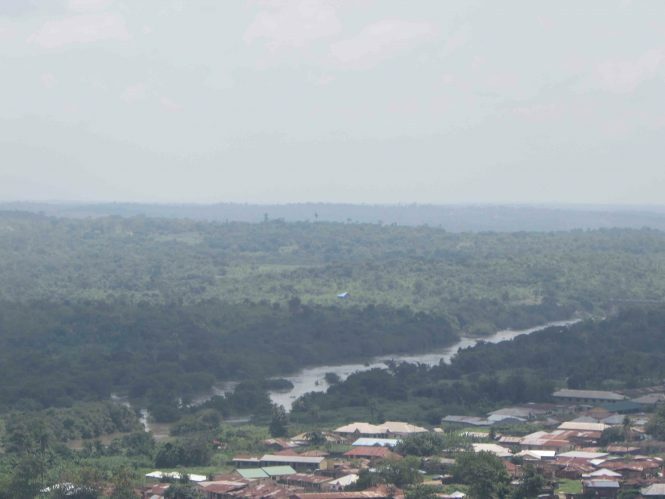 The old St. Peters Cathedral, the Ogun River, the city’s beautiful central mosque, the Alake’s palace and many others, can be seen from the top of the rock. Descending was not as difficult as climbing. At the base of the rock; one has the opportunity to visit the museum of history plain relax at the eatery. Professional guides are available at the site or from Lagos or Abeokuta. If you start from Lagos, your tour begins with a pick up from your hotel for a 90mins drive to Olumo Rock, Abeokuta in Ogun State. After the tour of the rocks you can stop for a meal at the city of Abeokuta, before heading back to Lagos. Praying on for His Grace and Mercy! This statement by Lori Hatcher on Crosswalk.com is so true as we await being able to travel to Kenya for an SIM Healthcare Conference and Leadership Initiative due to the uncertainties surrounding the Hurricane Florence. The organizers and some of the participants are already there but some of us are still in the US watching the turn of events in the wake of Hurricane Florence. We have had to change our flights a couple of times and are hoping that Joshua can leave on Saturday while Joanna follows on Tuesday. Joel is home from school as the University of South Carolina campus is closed and classes are cancelled through Monday. They anticipate resuming normal operations on Tuesday pending government direction. We are praying and eagerly anticipating God answering the prayers of many to protect lives and properties. Please pray along with us! 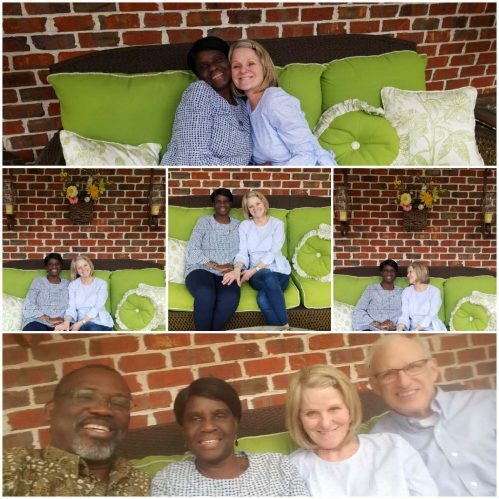 Thank you so much for praying for us and especially Joel and Jochebed as you read about them in our last prayer letter. Many of you responded with words of encouragement, prayers and great generosity. Joel started the semester well and with a great outlook for which we are thankful. He is happier and is more positive about his classes. Please continue to pray that God will perfect what He has started. Also remember to continue praying for the appeal that we sent for his scholarship as the decision making/proceedings have now started. We are still waiting for their response. Jochebed moved to a new 1 bedroom apartment from a studio apartment in a bad part of town and is settling in well. She is as busy as ever and we appreciate prayers for strength, wisdom and success in all her endeavors and give thanks for her safety while she lived at her old place. We were in International Leadership Team and Board of Governors’ meetings during the last two weeks. The two meetings went well and everyone has returned to their destinations safely. Praise God with us for unity that was evident as they met and deliberated on issues affecting SIM. Pray that God will establish all He has helped them to decide upon. 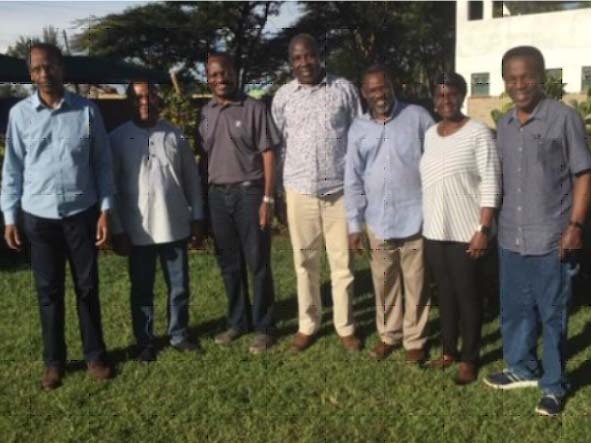 Pray for the SIM Healthcare Conference and Leadership Initiative starting on September 16 in Kenya and that all will go well. We will take a week of rest/holiday after the conference and then go on to the Philippines for SIM Philippines Spiritual Life Conference (SLC). Please pray that God will speak through Joshua as he will be speaking both in Kenya and in the Philippines. Pray that God will meet everyone at their point of need. Thank you for always being there for us in prayers and for your support. Stephanie Dyrness Lobdell | You are not the linchpin holding your congregation together (Images: Our Dream Cruises, Tracy Arm, AK, USA). I commit to being honest about my vacation anxiety. Some anxiety is appropriate. As the leader, I am responsible for ensuring that leadership is being raised up and trained to do the work of ministry. My husband and I are ultimately responsible for having all our bases covered. Pastors who leave town without a thought to what might go on in their absence send a message of disengaged inattentiveness. Is my anxiety rooted in fear or in a compulsive need to please the people of my congregation? Am I micromanaging the people around me and doubting their ability to do good work without my presence? Have I taken undue responsibility for the Spirit’s movement among the people of God to the extent that I believe that, apart from my physical presence, the Spirit will not (or even cannot) move? Is my identity so rooted in my vocation that the idea of time away from work is disorienting and unsettling? Yes, I will actually take my vacation. This requires wisdom and discernment. It’s probably not ideal to take two weeks of vacation in the middle of Advent. But I won’t kid myself into thinking every church function requires me to be there in the flesh. I will work to empower my leaders, be they pastoral staff or lay leaders, and then let them do their jobs. Equipping the saints for ministry is sacred work. I commit to being absent. When I leave, I will be as fully “gone” as possible. This may not require a costly overseas escape. A simple, affordable “staycation” will work just as well, if I take the call to absence seriously. That means I will need to communicate clearly that I will not be responding to emails, calls, or texts. But that’s not enough. I must follow through and stay off my phone and email! I will probably disconnect from social media as well. It has the power to make us present in mind and spirit to the wrong things, even when we are absent in the body. I will, of course, leave emergency contact info with someone who I trust to respect my absence—someone who understands the definition of emergency. I commit to being present. Being absent is only half the battle. As I embrace the call to absence from work, I must accept the challenge to be present—to my family, to my body, and to my spirit. Present to my family. I commit to paying attention to my loved ones in intentional ways. Even if I don’t go on a lavish trip or even leave town, I will find a way to spend quality time with my family. Present to my body. So much of pastoral work is work of the mind. After a long day of sermon prep, I find that I have left my seat perhaps only twice, but I am exhausted from the mental fatigue of studying. During times of increased stress and anxiety, my body lets me know through stomachaches, tight shoulders, and jaw tension—once so severe I could barely chew! I will use the time of absence from work to be present to my body through physical movement and bodily care. Exercise, even a simple walk, reminds me that I am a whole person, not a disembodied spirit or mind. Present to my spirit. It never fails that when I have a moment of stillness, anxiety pounces on my peace. My initial reaction is to flee or distract. Hurry, get busy! If I’m constantly moving, anxiety can’t slither in. Or, Start that Netflix binge! My mind will be too busy with the steady stream of entertainment for anxiety to get a word in. In her book Don’t Feed the Monkey Mind, Jennifer Shannon says this is the wrong approach to our anxiety. It sends the false message that the fear we are experiencing is dangerous and should be avoided. But it’s not dangerous; it’s just uncomfortable. Shannon encourages her readers to open their minds and hearts to the anxiety and to sit with the discomfort, thereby debunking anxiety’s lies and stealing its power. As I sit with the discomfort, I ask the Lord to remind me that I am his beloved, and with me, the Lord is well pleased. I confess the ways in which I have sought to do God’s work on God’s behalf. I ask the Spirit to heal the wounds that led me to these anxious behaviors. Without a doubt, taking vacation as a pastor can be a challenge. But time away is not merely important—it is essential for both the pastor and the congregation. Those of us who bear the mantle of pastor need to be reminded that we are not the head of the church. Christ is. Pastors are not, as Eugene Peterson puts it, “the linchpin holding a congregation together.” We are co-laborers with our flocks, cooperating with the Holy Spirit who is doing the work of calling, comforting, and convicting. Our congregations need a reminder that pastoral vacations can deliver blessings as well. They are not to be passive consumers of what the “professional” pastor has to offer, but rather to be engaged, contributing members of the body of Christ. By refusing to participate in the blasphemous anxiety to do the work of God for him and confessing the idolatry in our own hearts, we will shape our congregation to follow Jesus faithfully—more faithfully than 365 consecutive days of work ever could. Now, you’ll have to excuse me. I need to get back to planning my vacation. Stephanie Dyrness Lobdell currently serves as co-lead pastor with her husband Tommy at Mountain Home Church of the Nazarene in Mountain Home, Idaho. She blogs at www.stephanielobdell.com. 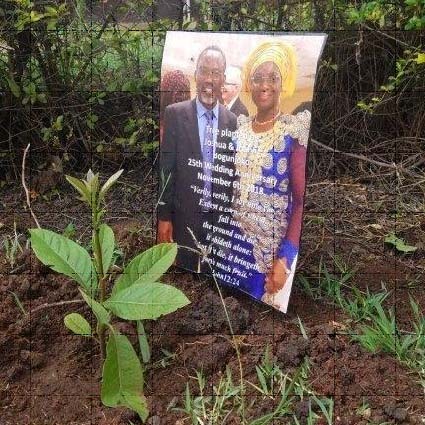 by Joshua and Joanna Bogunjoko, SIM International Director | We will be traveling for a month, and we ask for your fervent prayers to surround us. Praise the Lord.” Psalm 106:47-48. In our Christmas/New Year letter, we mentioned that SIM will celebrate its 125th anniversary in 2018. SIM will also be hosting our Global Assembly (GA), which only meets every three or four years. We thank God who has given us life to see this historic year and to celebrate with many people from SIM world. We are excited for all the Lord has done and all He is yet to do. We will be traveling for a month, and we ask for your fervent prayers to surround us. We will visit one of our regional offices, and then Joshua will speak at the Africa Roundtable of the ACSI (Association of Christian Schools International). Following that will be meetings of SIM’s International Board of Governors. Then our Global Assembly will convene for five days. Following this is a retreat for SIM’s Country Directors, and finally, a meeting of the International Leadership Team. for all the work that has gone into the preparations. for all the speakers God has uniquely called and prepared. for all the visas already granted. our preparations and travel, especially for all the reports that Joshua needs to write. our visit with the regional office, that we will be a blessing to them. 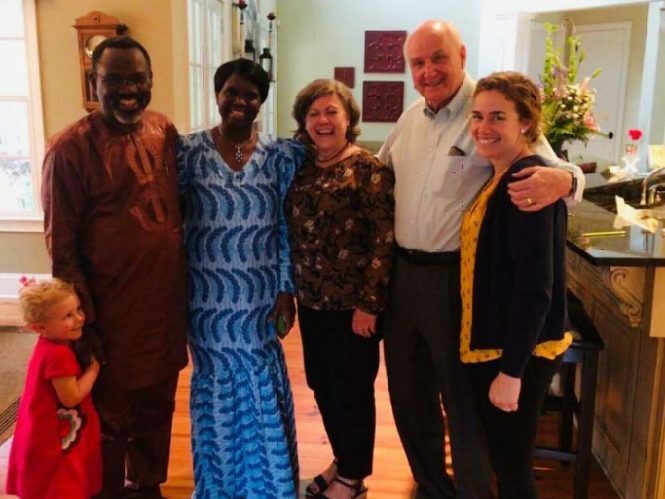 preparations for Africa Roundtable (Joshua will be speaking on “Africa Development and Partnership” – pray for the Lord to speak through him). all the preparations for Global Assembly. all the preparations for 125th anniversary year. traveling mercies for us and for all those who will be traveling. Jochebed and Joel to be well while we are away for almost a month. utterance, boldness, strength and good health for everyone. for God to grant favor and mercy to those still waiting to get their visas. Thank you for the special part you play in the fulfilment of SIM’s purpose and vision. Whether you've got a big trip planned or you're spending a day with your family in a nearby town, you may think parents and adult children traveling together could be challenging. After several years of wonderful trips with my parents, I've learned traveling with family can be rewarding, fun, and easy. And, I've got some practical advice to help make your trips go smoothly too. When my parents joined me in Paris for their 30th wedding anniversary back in 2012, we didn't plan on starting an annual tradition of traveling together. But the next year, around the same time as their anniversary and my birthday, they followed me to New York City to celebrate. Then the next year we wound up on the Vegas strip and took a helicopter down to the Grand Canyon. Then two years in a row we met up for a road trip down to Myrtle Beach. But this year, for their 35th wedding anniversary, we went all out, traveling the farthest we’ve ever traveled together, to my absolute favorite place on earth: Hawaii. TRAVEL TO SOUTHERN ITALY WITH GUIDEPOSTS! Through our many treks together, I’ve picked up some tips about how parents and adult children can travel together. Here are 6 ways to ensure you enjoy your intergenerational vacation. It was easy for my parents and I to decide to go to Hawaii–it's paradise! But we each had our own ideas about what would make our trip fun. My dad was satisfied to stay in Waikiki–a place he visits for work once a month–but my mom really wanted to venture off of Oahu and onto Maui. So, we split our vacation between the two islands. Since my dad rarely asks to do anything, I knew when he asked for us to take the Atlantis Submarines adventure on Oahu down to the depths of the ocean (ka moana hohonu), we had to do that first. We ventured down to the piers in Waikiki, took a relaxing boat cruise to the submarine in the middle of the ocean, and explored coral reefs, sunken ships and airplanes, and schools of fish 111 feet beneath the sea. The only other thing he really wanted to do was to walk on the beach in the mornings, so we got up early and walked with him. My mom really wanted to shop, so I took her to a local shop that sold made-in-Hawaii products, and I ventured off on my own one day to see 'Iolani Palace, the monument of the former Hawaiian monarchy, and learned of the tragic betrayal of Queen Liliuokalani, Hawaii's last monarch before annexation into the U.S. Though everyone wasn't up to go to the palace, they enjoyed hearing about what I'd learned later. It's great to do activities together, but leave some space for people to go off on their own and explore their own interests for a little while. It'll make the time you're together even more special. When you choose to share activities you love–and why you love them–with your family, it enhances all of your enjoyment of the experience, as you all learn a little more about each other. Maui is second only to Kaua'i on my list of favorite places in the world, so I was thrilled to put together a Maui itinerary of amazing experiences to share with my parents. When we landed on Maui, the first thing I did was rent a car and drive my parents up to Haleakala Crater, 10,000 feet above sea level. With it's red-orange clay ridges, ocean blue sky and white puffy clouds, it's one of the most stunning and serene places on earth, and a breathtaking view of God's creativity. That afternoon, we saw Ulalena, the play that shows the tragic and triumphant history of Hawaii through song, dance and jaw-dropping acrobatics. This was my second time seeing the play and its heartfelt performances still moved me to tears and taught my parents a great deal they didn't know about Hawaiian history. I then took my parents a few doors down the boardwalk from the Maui Theater to the Lahaina Grill for dinner where I had my favorite meal–the pink snapper–and shared with them bread and Lahaina Grill's signature rosemary and garlic butter. To our pleasant surprise, the owner of the restaurant, Jurg Munch, stopped over to say hello, and we were able to gush about all of our meals. He was so pleased with our enjoyment that he gave us copies of the recipes for our meals so we (meaning, my mom!) could make them back on the mainland. Next, I checked us into the Ritz-Carlton Kapalua–my favorite hotel on the island–and not just because it's a gorgeous hotel with a pristine beach. The Ritz is the first hotel on Maui that heeded the protests of native Hawaiians and redesigned their resort so as not to interfere with native sacred burial grounds. They also led the way in hiring Hawaiian icon Clifford Nae'ole as the cultural adviser for the property. Many other resorts in Hawaii followed their lead in creating cultural adviser positions to ensure that the properties are respectful and beneficial to native Hawaiians in some way. King Clifford, as I affectionately call him because of all he's been able to do to advance Hawaiian people and culture throughout the island and the world, founded and spearheads at the Ritz the annual Celebration of the Arts–which brings together Polynesian ethnic groups from all over to celebrate and share history, culture and art with the masses and each other. I've written for Mysterious Ways about how the hiuwai (Hawaiian sunrise cleansing ceremony) I did with Clifford in 2014 impacted my life. So I was excited to share that 5:30 a.m. ritual with my parents. Though Clifford couldn't lead the ceremony for us this time, he sent his friends, kumus (teachers) Kalapana Kollars and Anuhea Yagi to lead us in the hiuwai ritual on the beach. To the sound of nothing but gentle waves, my parents and I laid down our burdens in the ocean, reconnected to God, and came out of the water jubillant, giving praise for a new day and the rising of the sun, perfectly situated before us, just over the mountains in the distance. It's the kind of ritual in the perfect setting that can crack your heart open and giveway to fully loving everything around you, as God intended. Sharing the hiuwai with my parents and then hiking to nearby Makalua-puna Point made for an unforgettable bonding moment. 3) Google Activities and Accommodations in Advance. Make sure everyone knows what the accommodations are supposed to look like so there’s no surprise or disappointment when you arrive at your destination. Also, research the activities you're going to be doing together, to make sure that everyone will be able to participate. My mom had a hip replacement last year, so when I saw that our Atlantis submarine adventure required everyone to be able to climb and descend from a vertical ladder, I checked with her first, to make sure she wore closed toe shoes and felt comfortable on a ladder. When we drove up to Haleakala Crater, I'd packed ginger candy for us to chew on to avoid nausea that can come from driving around the narrow mountain roads' twists and turns. I also packed bottled water, bread and Surfing Goat Dairy cheese (my favorite and a Maui staple!) to stave off altitude sickness. Unfortunately, my mom didn't like the snacks and didn't drink enough water, so she did get altitude sickness and my dad wasn't properly dressed for the 50-degree weather we encountered so high up. We ended up leaving Haleakala sooner rather than later. Lesson learned: pack a light jacket and something everyone wants to snack on! More than 30 years separate me from my parents, but one thing my mom and I both love is posting photos on social media. If you decide as a family that posting vacation pictures is okay with everyone, share them on your social media platforms and tag your family members in them. Come up with a hashtag that everyone posting can use so you can all find your pictures quickly. Ohana means family in Hawaiian, so our hashtag for this trip was #OhanaTour2017. Just another fun way to revel in the memories as you're making them. Just because you’re family doesn’t guarantee you’ll agree on everything. In fact, at this stage in the parent-adult child relationship, you probably know exactly what might set someone off and jeopardize your fun trip. Avoid those topics like the plague! There’s a time and place for tough and necessary conversations, but your fantastic vacation is not one of them. Resign yourselves to enjoying your trip and enjoying each other. If you see the conversation spiraling into a bad place, steer the conversation back to something pleasant. Resolve to keep the peace and remember the purpose of your vacation: bonding. ​As children transition to adulthood, the parent-child relationship and the expectations and responsibilities of each are bound to change. Embrace it! Vacationing together when all parties are adults and can communicate their wants, needs and expectations with more emotional maturity provides a perfect opportunity to deepen your family bond. Whether childhood was idyllic or volatile, adulthood allows a chance for everyone involved to start again—if all parties agree to do so—and forge a relationship that can be healing and enjoyable. It was a blessing for me that my parents were able to let go of their roles and identities as my providers and to instead allow me to treat them to amazing, once-in-a-lifetime experiences, to teach them something new and to give back in some small way what they've given to me my entire life. When you let go of the past and your former roles in each other’s lives, you can get excited about building something new together. Brooke Obie and her family visited the Ritz-Carlton, Kapalua, Atlantis Submarines Waikiki and Maui Theatre's Ulalena courtesy of each corporation. Her favorite experiences are highlighted in this article.